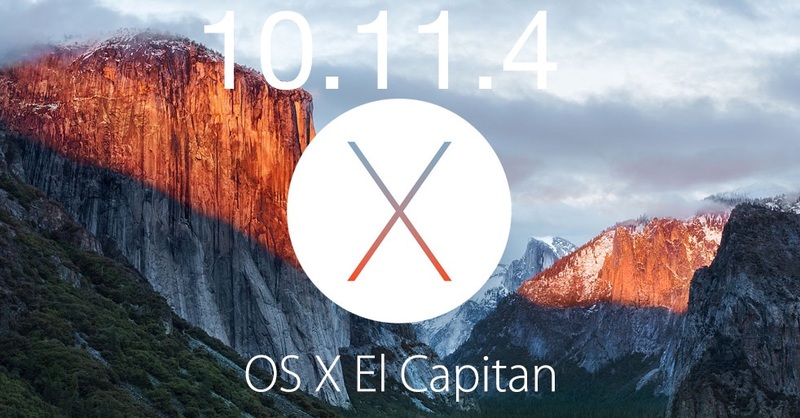 Apple has released OS X 10.11.4 for Mac users running El Capitan. The new version supports Live Photos in Messages app, password protected Notes, and includes compatibility support for iOS devices running iOS 9.3. Additionally, multiple bug fixes, security improvements, and overall improvements are included in OS X 10.11.4, making it a recommended update for Mac users running a prior versions of OS X El Capitan. Aside from El Capitan, Mac users running prior versions of OS X will also find a security update available which is recommended to install. Mac users running a prior version of OS X can find the latest version available now from the Mac App Store, the App Store represents the easiest way to install the software update. As always, be sure to start a back up of your Mac and let it complete before starting the software update process. Did you backup? Don’t skip a Time Machine backup! The Mac will automatically reboot and complete the installation of OS X 10.11.4. 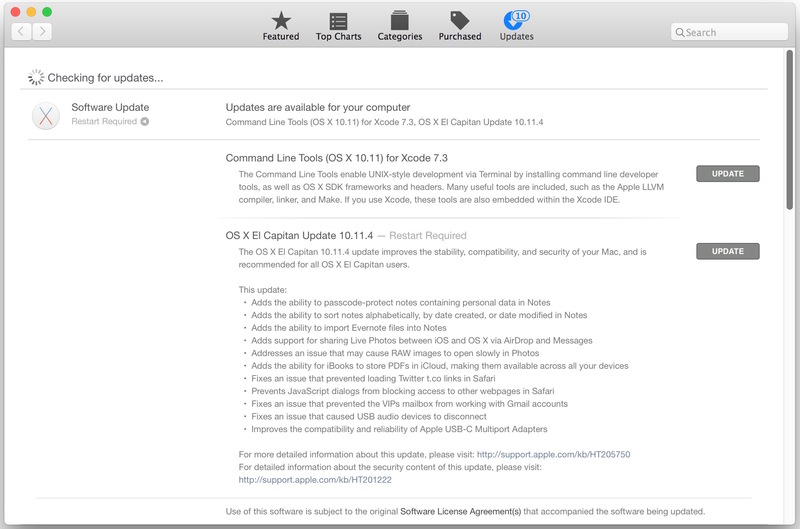 The combo updater allows Mac users to update to 10.11.4 from a prior version of OS X 10.11 (10.11.1, 10.11.2 or 10.11.3), whereas the regular updater only updates from the immediate predecessor release of OS X 10.11.3. Finally, Mac users running earlier releases to OS X EL Capitan will find Security Update 2016-002 and Safari 9.1 available for OS X Mavericks and OS X Yosemite. Those are recommended updates if you’re not running El Capitan, both available from the  Apple menu Software Update mechanism of the App Store. Separate from the Mac, iPhone and iPad users will find iOS 9.3 available to download, and watchOS 2.2 and tvOS 9.2 are available as well. Some Mac users have reported a variety of issues with installing OS X 10.11.4 on their Mac. The problems may vary from a frozen or stalled installation, to unexpected crashing during the update, and a variety of other issues. Some users may encounter a kernel panic on boot or during the update as well. Users may be able to remedy a failed update process by rebooting the Mac into Safe Mode (hold down shift key during boot), and then downloading and running through the update again using the Combo Update for OS X 10.11.4. This can often resolve installation errors and update failures. One common reason for some Macs to kernel panic during the system update is due to a third party kernel extension called SUIDGuard, which hasn’t been updated to support OS X 10.11.4 yet. If you have installed the SUIDGuard installation, you would need to remove it before being able to complete the update by rebooting the Mac into Safe Mode with the Shift key, then open “/Library/Extensions” and look for “SUIDGuardNG.kext” and delete it. If the update is successful but the Mac is running slower after updating to OS X 10.11.4, simply waiting for the various Spotlight and maintenance processes to complete usually remedies the speed issue and any potential rapid battery drain. This can take an hour or more depending on the speed of the Mac and the amount of data it accesses on a drive, so patience can be important. In some cases, the only solution is to restore back to the prior OS X release with Time Machine, perhaps while a few remaining bugs or quirks are worked out. If you have any particular experience with a problem updating, or troubleshooting the OS X 10.11.4 update, let us know in the comments! The Mac App Store download of OS X 10.11.4 is going really slow, I ended up getting the Combo Update and used that instead, very fast to download that way. Great way to update Macs. Installing iOS 9.3 now, wish me luck! I’ve been stuck trying to download El Capitan for 2 days now. Even though I have 100mbps download speed I’m getting 100kb/s when downloading from App Store. I ran into this same problem with an old Powerbook and Yosemite. If your connection or computer is too slow to respond the Apple server will time out and put at the end of the queue. Over the years, they continue to short the data transfer handshake response time. I would try doing to a friend’s place with a faster connection. I’d just recommend to not to do the 10.11.4 update many users report not being able to use ANY of their applications so hold off until it gets fixed. Is the link to the combo update working? doesn’t seem to point to such? wtf? I can’t wait until Wharf comes in here whining and crying! I didn’t see anything in the text when downloading the update if they had worked on bugs in other apps they have provided in the past. Seems all they want to tout is the apps that they think might make them money in the future and screw the rest of the apps. You need to update individual Mac apps, like Pages, for bug fixes specific to those apps. If it’s not included in a default core OS X install it would not be covered by an OS X update. I am on El Capitan for my primary Mac, and Mavericks for secondary. Glad they are still issuing security fixes for older releases. My Mac book Pro has started to freeze a lot lately, hope this update might cure this issue. Am loading 10.11.4 from package. Been staring at an apple logo and full progress bar for a half hour. It can take a while depending on the speed of a Mac, let it sit for at least a few hours particularly if it’s old or slower traditional HD. If it fails completely, get the Combo Update and install that instead. Thank you. I gave up after an hour w no visible change. I was upgrading from 10.11.3. I simply turned off the 2 yr old dual 27″ iMac, waited a bit, then restarted. Up came an El Capitan mini window dead center with the image and the X, and some text that read, installing this will take about 11 mins. After that no problem. I assume I missed an alert box or something as I had walked away for awhile. So, so far no problems. Good luck everyone. The 9.3 update to my iPhone and iPad was very quick. The 10.11.4 has been running for over 2 hours on my laptop. 1) Change the Hot Corner action to something different. 3) Change the Hot Corner back to the original action. Alternate 2) Log out, then log back in. I think the update (via App Store) crashed my oldish iMac (the model with the DVD drive). I will know in a few hours time whether my Time Machine backup will fix it. Drat! After a Time Machine restore, I can now start in Safe Mode. Not in normal mode. Drat again! The update appears to be intermittently crashing my system. Anyone else having issues? Is the entire Mac crashing with a kernel panic? Or is it just a specific app that crashes? Is it freezing or something else? After a crash, you can view the Console app log to see if anything particular is acting up. OS X 10.11.4 remains very stable in my experience, no crashes for the system but some apps can misbehave as usual. If it is an app crashing, see if there are updates available to that specific app, sometimes developers are slow to update though. Well my Mac completely freezes at random after installing this update from Apple. I used the combo update. Not a traditional crash but a full blown system freeze. Mouse stops moving. All process stops. So, consider this a beta. Have same system halts (2 in a row now). Same problem here. System was very stable until installing this update. Has two freezes after installing 10.11.4. I get many freezes and crashes since updating to OS X 10.11.4, tons of beachballs and stalls in Safari too. What a terrible software update. Apple has no quality anymore. The lesson continues to be taught; don’t update any Apple software. Installed and then computer failed to start with “Unexpected sigkill dump”. Tried everything, Apple said that it was a hardware error and couldn’t help (mac is 6 years old). Now restored from Time Machine and running file so I won’t upgrade this time. Frightening few hours. You could try updating with Combo Update, which may fix the problem, but it’s a good thing you have Time Machine backups either way! I used the combo update and it has gone smoothly for installing, but OS X 10.11.4 “freezes” and beachballs more often than 10.11.3. I thought this thing went through beta?? Sheesh. omg! I’ve been trying to figure this out for months! Thanks so much! Still getting that error message when trying to update my pages app in appstore.. any advice? Downloaded through the app store and computer completely froze to a white screen. Had to power down and restart and now it says the process isnt finished and needs to restart. Everytime I try to restart it does the same thing. Powered it back up in recovery mode and reinstalled OsX and now certain apps like itunes are unusable and launchpad shows osx to be paused. Want to try and see if it will update now that I installed fresh software but also dont want to have white screen freeze again. I would try the Combo Update approach, it can often remedy weird situations like that due to installation errors. I did the 10.11.4 update on a spare drive, The only porblem so far is that my generic icon folders became generic documents. Launch services and icon servces rebuild did not help.Any ideas? For some reason this update caused my 2013 MBP 13″ Retina to crash and shut itself down shortly after every login attempt. Diskutil and fsck didn’t fix it. Eventually had to use Mac Recovery to reinstall OS X from the internet. All sorted now, but took a helluva long time to download El Cap over my rural broadband connection! Since the 10.11.4 update, I can no longer connect to the Mac App Store. The window opens and I get the spinning ball, but nothing ever loads. Reboot and your computer should work again, however, SUIDGuard will be removed. I just updated to 10.11.4 on my macbook pro 2015 13″. I was hoping that my airdrop would work but STILL not detecting my iPhone 6s and my iPad 2 both updated to OS 9.3.But My iPad can airdrop on iPhone and vice-versa. But they can’t detect my Macbook. does anyone have similar concerns? on my 2015 15″ MacBook Pro, download of 10.11.4 through the app store took several hours, despite fast internet collection, i ended up going to bed and leaving it downloading overnight, so i don’t know exactly how long it took. this morning my laptop was powered off so i powered it back on and the 10.11.4 update appeared to finish installing (took about 10 minutes to complete), then as usual my login screen appeared. i logged in and everything looked fine. i go to open Safari browser and get an error message “…cannot open Safari because it is damaged…” or something similar (i don’t remember the exact wording). i then tried to open iTunes with the same result. next i tried opening FireFox with the same result, so i go to my applications folder to discover that all my apps are gone (in other words, there are no apps in the applications folder). nor were there any docs in my documents folder. My Xcode update to 7.3 is stuck on installing. It’s had 4 minutes left for the last hour. Any idea what’s going on? Same here. I am going to reboot and see what is going on. It has also trashed my iscsi initiator with signature issues. This will likely cost me $195, or whatever that is in GBP, for a new initiator. I just downgraded to Yosemite. I already knew what was coming, and Yosemite has its issues, but I’ll take “Known flakiness” to “Actually broken”. These go through beta and I’ve reported my issues with VoiceOver especially. I don’t know why Apple only ever responds to a tiny sliver of reports. Then again, iPad Pro is going to replace the PC (and, by extension, Mac) so I don’t suppose it’s too hard to figure out, really. A surprising amount of people are having problems with OS X 10.11.4, OS X 10.11.3 appears to be the most stable build. Apple isn’t paying much attention to software quality these days. iOS 9.3 has bricked thousands of “older” (two year old) devices with similar lack of quality. They should be ashamed, but it’s all about the profit and selling more iPhones. Has anyone else noticed their Mac runs MUCH SLOWER after OS X 10.11.4? I get hangups, hangs, temporary freezes, and all sorts of LAG that I never had before. Brand new MacBook Pro Retina model, high end model, this should not be a slow machine! This update is not good. I did the upgrade to 10.11.4 as well but in my case it got stuck in the reboot cycle. After trying several boot options at home including install from recovery disk, I called Apple. After explaining what was going on, the rep said they figure it is an EFI problem – so pre-boot. Now waiting to hear back from a local Apple tech on how much it will cost to fix. I have a 2012 13″ MBP running smoothly on 10.11.3 (with a 1 TB SSD rather than the original HD). After reading this thread, I just decided that I am not upgrading this computer anymore! My next upgrade will be a new machine, but not any time soon. Has this certificate problem been resolved? I installed 10.11.4 with the Server app on my Zencart commerce server and ALL authorize.net and paypal payment functions stopped. I had to time machine back to 10.11.3 to work again. Never mind the issues with mysql and time machine – lost a few days of orders with the restore. I installed the new update on my macbook and since then my internal superdrive does not want me to insert a cd/dvd into the drive. The leaver does not want to open when I want to insert a disk. Very sorry I updated my machine. Now it’s slow, the Mac is almost unusable. Just great. update doesn’t let me reboot on my iMac 2015 – just keep getting the apple logo and then a black screen – after 3 hours I’m giving up and will take to an apple store – tried the online help but that was along the lines of ‘turn it off, turn to on’ etc. can i download this update and get it to work? it is really frustrating me. if there are other means or links, please i would love to be in on the info. thanks. I installed the new update 10.11.6 on my macbook and since then my internal SuperDrive does not want me to insert a cd/dvd into the drive. The leaver does not want to open when I want to insert a disk. IOS X 10.11.4 needed if I want to update my photos in my Iphone.Request started 4 days ago and I had been trying to download OS X 10.11.4 with no result…I am no good with computer but need it to update my photos in my Iphone. You guy should programmed more user friendly.There are no indication that the installation is complete or not..I have been staring at the screen for more than 25 mins hoping for some signs….nothing after the box showing the OS is out. I am at a lost…any bright ideas. I agree with you it would be good to have more indications on the status of installation. But this is a fan website, nobody here programmed anything to do with this. You are reading an article about this, not talking to programmers or developers. I had waited till the 10th folders were out with a ‘Finalising’ remark on the 10th Folder…still I waited for another 20 mins just in case before closing.I am feeling very let down and regret that upgrading request by the system…it was working fine before that….Hello,can somebody help?? ?